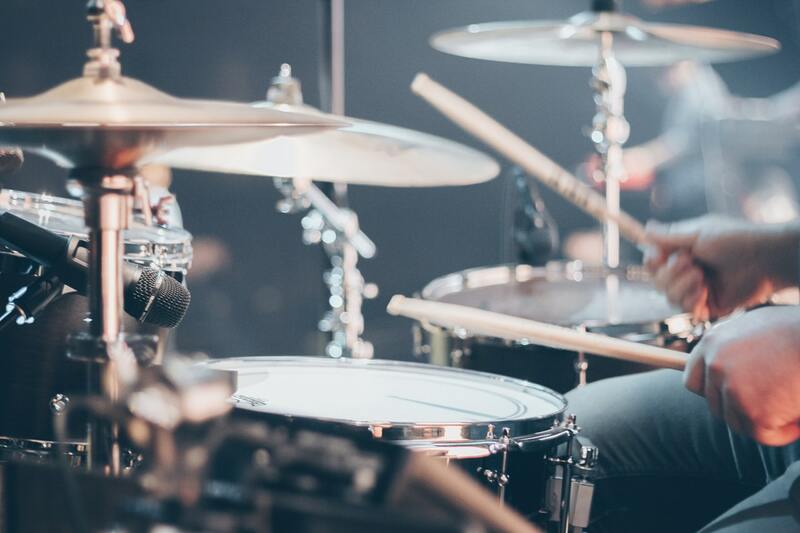 The modern drum kit includes many different sizes and variations of cymbals, high hats, drums, peddles, drumsticks, electronic drums and all kinds of percussion instruments. The basic set up of the drum kit (also called ‘kit’) usually includes a high hat, snare drum, toms, bass drum, and at least one cymbal. The style of music and type of drummer will then determine the exact set up of the drum kit. It is often forgotten that the modern drum kit has evolved from separately played drums, percussion instruments, and cymbals. At one time, it was normal for each part of the modern drum kit to be played by different players. Orchestras and marching bands played with a cymbal, snare drum and bass drum player. 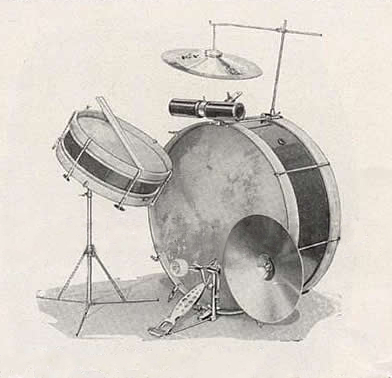 However, in the 1860’s players began to experiment with drum setups after two important developments. The first development was the creation of the bass drum pedal which allowed a player to hit the bass drum with their foot as opposed to hitting it with mallets or sticks. The second important development was the snare stand allowing the player to have the snare drum propped as opposed to it being suspended from the player. The development of the kick pedal and snare drum was important because musical theaters or stage shows as well as other bands could play music on a budget without an excess of players. Military bands also disbanded at the end of the American Civil War. Some continued to play in small-town American bands. They often limited their equipment and players to fit into smaller venues. This resulted in experiments with playing multiple drums at the same time. The first commercially made kick pedal was created in 1909 by Ludwig & Ludwig Co. of Chicago. The kickstand allowed players to have both of their hands-frees to play other things. Around the time of World War, it was common to see marching band bass drum players with symbols suspended on top. Musical theaters also experimented with new setups because of limited space, in their theater pits. By the 1930’s it was common to see swing bands with full drum kits and the evolution of the modern drum kit had begun. The drum kit has come a long way from wooden shells with skins stretched on the top. Military bands, theaters and the evolution of jazz all played a part in the creation of the drum kit.